The Samsung Galaxy Tab S2 arrived to take on the iPad in 2015. It's since been superseded by the Galaxy Tab S3 and the Galaxy Tab S4, but if you can find it at a decent price online it might be worth a look. One advantage of going for older hardware is much cheaper prices: in fact it's likely to be one of the cheapest tablets around if you do a bit of searching online. The Samsung Galaxy Tab S2 is just one device in an increasingly long line of Android tablets aiming to take on the might of the iPad. iPad sales have had their ups and downs, but they remain the first product many people – like my dad, for instance – tend to think of when it comes to tablets. Any competitor has to have something special to stand out. Unfortunately, the Samsung Galaxy Tab S2 doesn't do much to differentiate itself, aside from running Android, with two new screen sizes (8-inch and 9.7-inch) that originally matched the iPad Air 2 and iPad mini 4 in a 4:3 aspect ratio. Prices were also identical back in 2018, launching at $499 (£399, AU$599) for the 9.7-inch tablet, and $399 (£319, AU$499) for its 8-inch mini equivalent. However, you can now find them for cheaper than that if you look around – especially with holiday sales days approaching. Regardless of the price changes, the Tab S2 tablets still have something to offer, and with later Tab S tablet releases Samsung has continued to keep pace with the iPad releases put out by Apple. The good news is that, once I got to hold the Samsung Galaxy Tab S2 in my hands, I discovered some differences that favor Samsung's new tablets, as well as a few that do not. Weight, design, and software features made the new Galaxy Tab one of the best tablets to date back in 2015, even though the slate looked like it was doing its best impression of an iPad, and wasn't too different from previous Samsung tablets. The Galaxy Tab S2 feels nicer to hold in two hands than the Samsung Galaxy Tab S 10.5 and its sibling the Galaxy Tab 8.4 did. In fact, it's light enough to comfortably clutch in one hand. 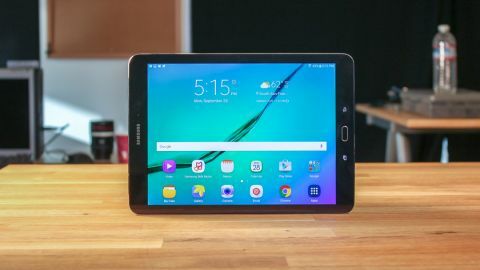 Weighing just 389g for the 9.7-inch tablet and 265g for the 8-inch version, it sheds the extra weight of its Samsung tablet predecessors, and at the time of launch it was also noticeably lighter than Apple's entire iPad line. That's a big deal, believe it or not, because holding the larger Tab S2 in its ideal position – in bed reading Flipboard while holding the tablet in the air – isn't a strain over long periods of time. Similarly, if you throw this tablet in a backpack it feels like no extra weight has been added. It's easy to store and effortless to hold, even with its near-iPad dimensions. The 9.7-inch version measures 237 x 169 x 5.6mm, and the 8-inch model 199 x 135 x 5.6mm, beating Apple's sub-pencil-thin thickness of 6.1mm. The Samsung Tab S2 is lighter than its predecessors in part because it's backed by a soft-touch plastic cover instead of an aluminium shell. Metal edges outline the tablet instead of the plastic frame previously used. The entire device may not be metal, but it does feel smooth. It's better than the dimpled plastic of the Samsung Galaxy Tab S, yet remains just as grippy. Two small, springy buttons are embedded into the back of the Tab S2, but they're meant for clipping a cover onto the tablet and aren't releases to pop off the back, which is all sealed shut. There is, however, a microSD card slot on the frame to optionally boost the 32GB and 64GB configurations with an additional 128GB of expandable storage. Alongside this same rail are a solid-feeling power button and volume rocker. Stereo speakers, a headphone jack and an off-center microUSB port line the bottom of the tablet. The Tab S2 has a physical, fingerprint-sensing home button in front with the usual oval shape, and two capacitive buttons on either side. These keys light up by default every time the display is touched. The beams of light are a bit distracting when scrolling and reading text near the bottom of the screen, and turning them off in settings doesn't help orient your fingers in the dark. This wider tablet isn't like a narrower phone, where you know the exact location of these keys. The Galaxy Tab S2 comes in three colors: Black, White and Gold. Gone are the fancy names like Dazzling White and Titanium Bronze, reflecting Samsung's minimalist design with this ultra-thin tablet. Samsung has the best displays among smartphones with its Galaxy S6 and Note 5 handsets, and the same is mostly true of the Samsung Galaxy Tab S2. The Samsung Galaxy Tab S2 boasts a bright Super AMOLED screen with vivid colors and a 2,048 x 1,536 resolution that matches the iPad Air 2 and iPad mini 4. That's good, but not the best from Samsung. The earlier Galaxy Tab S slates had a resolution of 2,560 x 1,600, with more pixels per inch. The Tab S2 is technically a step down in that regard, even if you can't notice at first glance. What happened? While the S1 sported a narrow, movie-friendly 16:9 aspect ratio, the new Tab S2 is wider, with a letter paper-sized 4:3 aspect ratio. It's more suited for web browsing and similar tasks. Samsung dialed back the resolution in its rejiggering of the screen, but that the pixel count shouldn't concern you as much as the aspect ratio, especially for widescreen movie watchers. The Galaxy Tab S2 display is still really sharp and vibrant, but has a different objective that's bent on three things: web surfing, Flipboard reading and iPad rivaling.